If you follow our work, you know that FMC are longtime supporters of a public performance right for AM/FM broadcasts. The reasons are simple: we think it’s crazy that recording artists in America recieve no compensation for the use of the work on good ol’ fashioned radio. The situation is even more galling when you consider that the rest of the developed world pays performers and sound copyright owners (often labels, but can be artists) for over-the-air plays. The US, as an exception, is in the not-so-terrific company of Iran and North Korea in not paying performers squat. Consider this. If you hear Counting Crows’ recording of “Big Yellow Taxi” on AM/FM the radio in the US, Joni Mitchell—the composer of “Big Yellow Taxi”—is compensated. And it’s great that Joni gets paid. But it’s less cool that Counting Crows receive nothing for this performance. However, if you hear the same performance on Sirius/XM, Pandora or other webcaster—even on that terrestrial radio station’s webcast—both Joni AND Counting Crows are paid. Kinda weird. That’s why we’re psyched to see singer-songwriter, producer and artist-friendly label dude Blake Morgan rallying the troops in support of a public performance right for terrestrial radio. Blake, in association with the emerging Content Creators Coalition, just went live with IRespectMusic.org—where artists and fans can sign a petition calling for Congress to enact a performance right for terrestrial radio. There are a ton of reasons to support the public performance right. One of the more compelling ones is that without something in statute, American musicians have no way of collecting money owed to them for overseas plays. This situation is especially rough for artists in non-pop genres. Even if consolidated commercial radio in the US doesn’t play many niche genres, these uniquely American art forms are still cherished around the world. Just because a great blues singer or jazz soloist didn’t compose the music they are so closely associated with doesn’t mean their performance doesn’t have value. Can you think of another export America would trade freely on the global stage without any expectation of compensation? Commercial terrestrial radio stations have enjoyed an unfair advantage over their competition for too long. If you use music to build your business, you should pay for it. Full stop. 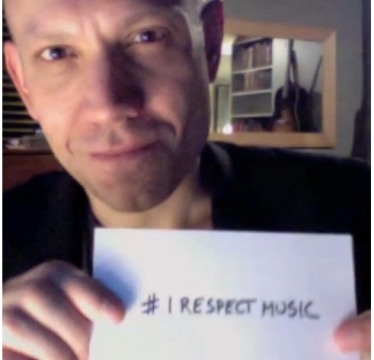 We encourage you to check out www.IRespectMusic.org, sign the petiiton and spread the word. Blake and the gang are also hosting a meetup with live music on February 25 at Le Poisson Rouge in NYC. the CCC site and IRespectMusic will have more info soon. And if you want to learn more about the public performance right for sound recordings, check out our handy fact sheet. Submitted by Kelly (not verified) on January 28, 2014 - 3:09pm. I super want to support this, but currently there is no petition linked or available to sign on the irespectmusic.com link. Just the instagrammed video of TheBlakeNelson signing a card with "I Respect Music."